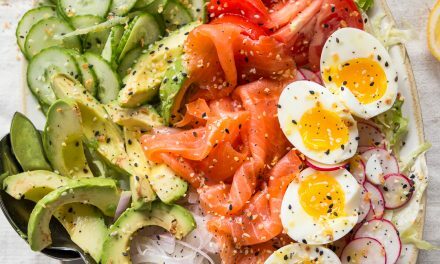 This Asian Smoked Salmon is easy, delicious and happens to be Whole30 and Paleo compliant. 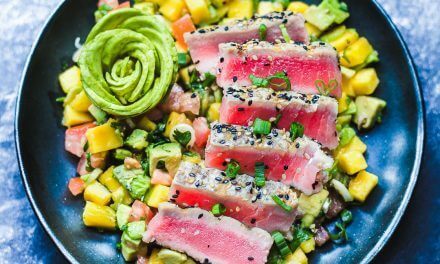 It requires only 6 ingredients (7 if you include water and 5 if you omit the chili flakes!) and thanks to the Traeger, is absolutely fool-proof! 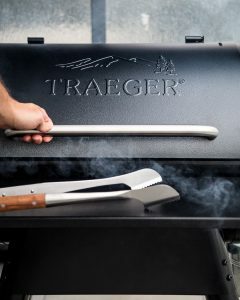 I love this grill so much that I’ve partnered with @TraegerCulinary to GIVE ONE AWAY! Click here to enter for your chance to win! 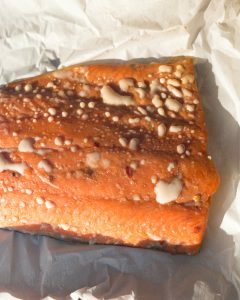 There are a few things I learned over the course of testing this Asian Smoked Salmon situation. The first is you must, MUST, start with a quality filet of salmon. Because there are so few ingredients, the salmon has very little to hide behind. Using a sub-par salmon will yield sup-bar results. Personally, I like to use wild-caught salmon. I purchase frozen filets of wild coho salmon from a local grocer at a reasonable price. It is lean and has a fairly strong flavour, but I don’t mind. I will admit, I do prefer the texture of farmed salmon. It’s fatty, meaty, milder and melts in your mouth. The trade off, however, is that most farmed salmons are high in toxins, treated with antibiotics and even colouring. Not to be a fearmonger, but did you know that certain salmon farms can custom colour match the flesh of the fish to suit your marketing strategies? I encourage you to read more about the topic before making a decision for yourself. I made the switch a long time ago and haven’t looked back since. 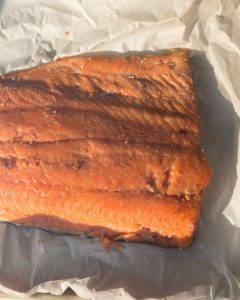 The other trade secret I picked up when testing this Asian Smoked Salmon is the process of brining the fish before smoking. In it’s most basic form, the process of ‘brining’ refers to soaking (in this case fish) in a salt-water solution. 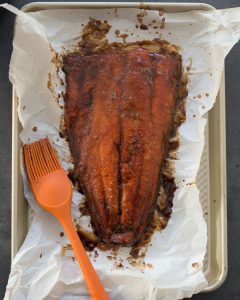 You can also opt for a dry-cure and rub the fish with a salty rub of sorts. 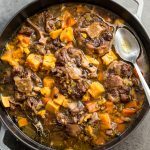 It can be flavoured with herbs, spices and citrus. Get as crazy as you like. I went for a brine this time around so that I could impart some Asian-inspired flavours by using coconut aminos. 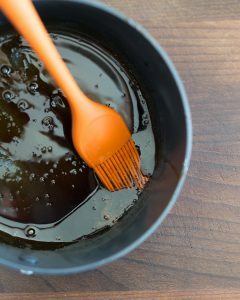 Not only does it infuse the salmon with a delicious sweetness, but it also adds a beautiful caramel colour. 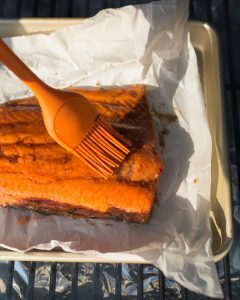 There are a few benefits to brining or curing your salmon before smoking it. In fact, the same rules applies to roasting salmon. The salt acts as an antimicrobial agent. Curing is a very old technique of preserving fish. Meaning, if you cure or brine before smoking it will likely have a longer shelf/refrigeration life. The same is true of just smoking. 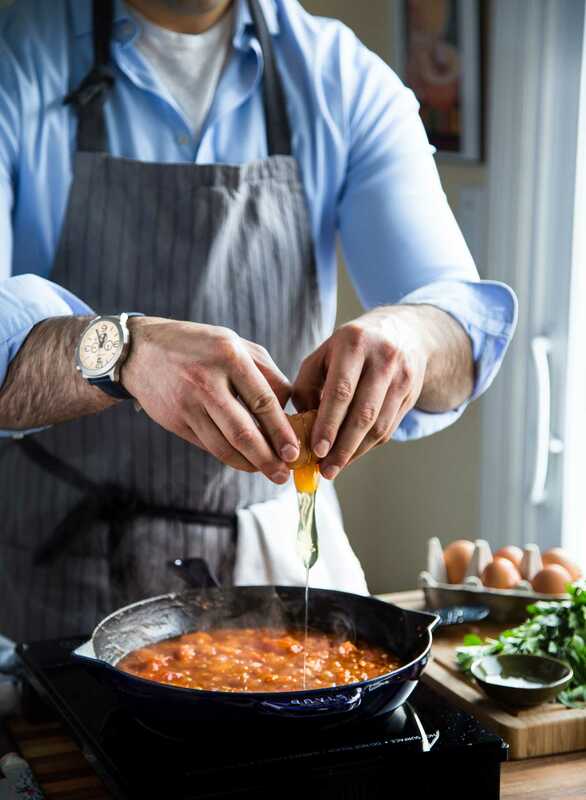 It allows you to impart some incredible flavours into the fish. You will reduce the build up of albumin as the fish cooks. 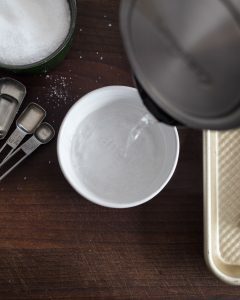 Most brines call for 1tbsp of kosher salt for every cup of water. In testing, I found this to be a bit too salty. Especially true for those who fail to read the recipe specifics and choose to use table salt in the place of kosher salt. Consider yourself forewarned! 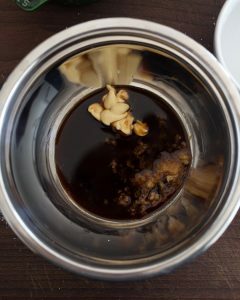 I found some success in using 1.5 tsp for every cup of water. Granted, I was testing 1lbs filets at a time. The filets were approximately 1″ thick at most. If you are cooking a 5lb salmon filet that is upwards of 2″ thick, than a saltier brine may be necessary. Either way, make sure you are using a kosher salt in your brine. In terms of smoking the fish, I could not be happier with my Traeger. It is unbelievably easy to use. 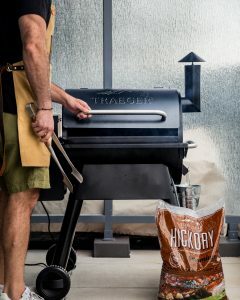 Essentially, the Traeger works as an outdoor convection oven powered by wood pellets. There is no direct heat or flame-contact with the food. Instead, a hopper feeds wood pellets to a heat chamber that causes the pellets to combust. The lower the temperature setting, the more smoke is produced because of the rate at which the heating element is working. The higher the temperature setting, the less smoke is produced. On the Pro22 model, everything is controlled via the analog temperature knob. The grill itself is electronically powered so you do need to have access to an electrical outlet or generator to use it. It’s as easy as turning the dial and letting the grill do the work. I’ve managed to turn out some unbelievable food on my Traeger and am a huge fan of the product. If you keep up with my Instagram you know this to be true. Honestly, prior to getting these grills I developed a serious love-hate relationship with smoking. I couldn’t keep a consistent temperature if my life depended on it. And since smoking is all about the long game, I couldn’t be happier with the user-friendliness of the Traeger. 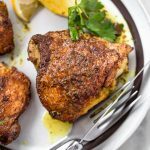 If you do not have a smoker, but still want to cook this recipe, you can simply follow all of the instructions leading up to the smoking. 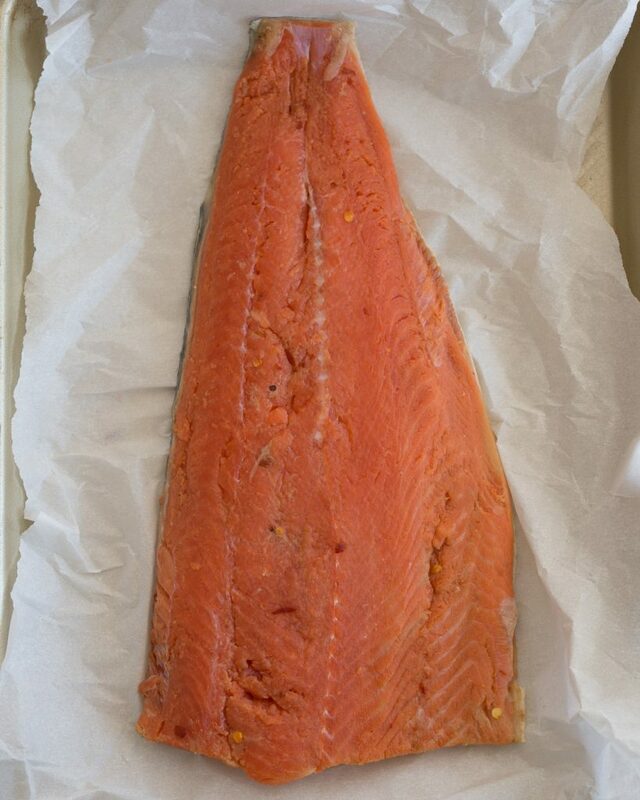 Then, simply slow-roast the fish in your oven at 275F until the salmon reaches an internal temperature of 145F. You won’t get the smokey flavour, but you’ll still be rewarded with a delicious finished product! 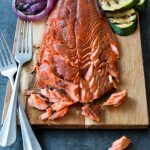 This Asian Smoked Salmon is easy, delicious and Whole30 and Paleo compliant. 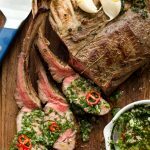 It requires only 5 ingredients and thanks to the Traeger, is fool-proof! Combine boiling water and salt in a bowl. Stir to combine and let cool to room temperature. Add ¼ cup coconut aminos, garlic, mustard and chili flakes (optional). Stir to combine. Rinse and pat salmon dry with paper towel. Place in a zip-top bag and pour in the brine. Squeeze as much air out of the bag as possible, seal and refrigerate 3-4 hours. 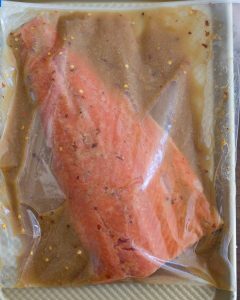 Remove salmon, pat very dry with paper towel and place on a parchment-lined baking sheet. Discard brine. For best results, let sit 2-3 hours uncovered in the fridge to fully dry and develop a pellicle. Set Traeger to smoke setting. 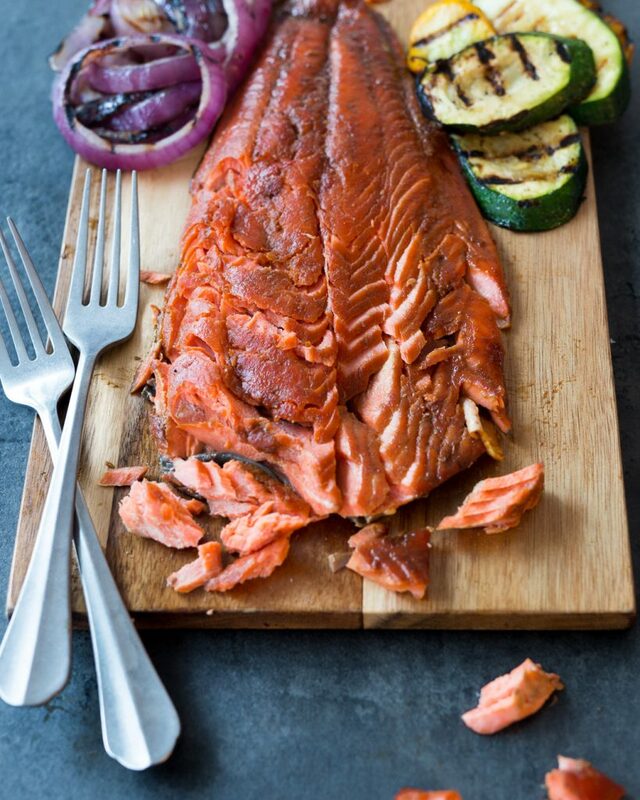 When white smoke builds, transfer salmon on baking sheet to the grill. Smoke for 45min with lid closed - no peaking. Meanwhile, heat remaining ¾ cup coconut aminos in a small stockpot set over med-low heat. Reduce coconut aminos until they are at least ½ the original volume. Set aside. Wipe off any white albumin with paper towel and baste with reduced coconut aminos. Raise heat to 225F. Cook an additional 45 min or until internal temp of the thickest part of the salmon is 145F. Baste salmon with reduced coconut aminos every 20 minutes and once more before serving. 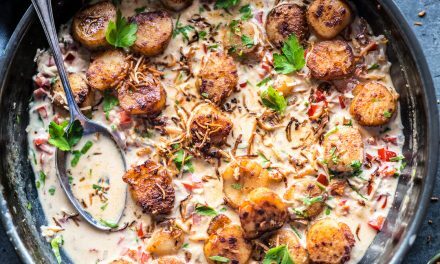 Serve alongside grilled vegetables of choice and any remaining sauce for dipping. 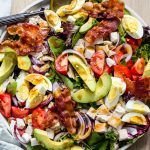 Would it work to use sea salt instead of kosher salt? Also, approximately how long would I bake the fish to reach internal temp of 145 degrees? Did you ever figure out how long to do it in the oven? Haven’t tested it in the oven yet but my guess would be around 45-60min or so, depending on the thickness of the filet. If I use a electric smoker, what temp should I have it at? 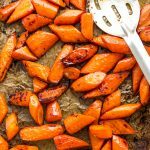 What would I do with an electric smoker? Temp and length of time? Can you be more specific in what you mean by an electric smoker? 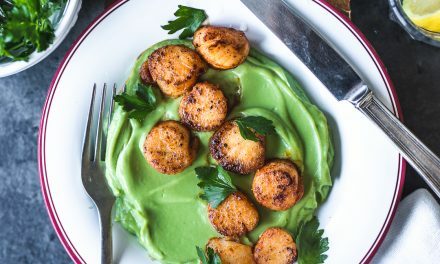 My boyfriend and I made this recipe and it turned out amazing! We ate it with the coconut tzatziki and it was delicious!